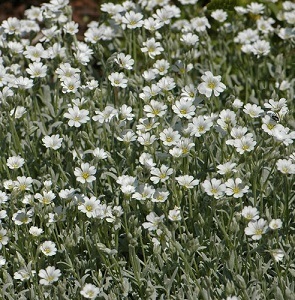 Snow-in-Summer grows a creeping mat of attractive silver-grey leaves, with masses of white flowers from May to August. Plants grow to a height of 10-20cm and spread out to about 60 -100cm. They are great for ground cover, rockeries and pots. The leaves are mostly evergreen but may die off in colder areas or colder winters in the UK, re-growing again in spring. They are very cold hardy, tolerating winter frosts to about -30 degrees Celcius. Cerastium grows in most soils, but does need sun to part shade to do well. They are drought tolerant once established. Pack of approx 500 seeds. Sow in early spring to autumn. Sowing instructions and a colour photo are printed on the packet. Conditions Grow in full sun to part shade and all soils. Sow in early spring to autumn in a tray of seed compost. Cover lightly (about 2mm) with compost, keep at 15-21°C and germination takes 2-3 weeks. Transplant seedlings into pots when they are large enough to handle and out into the garden after the last frost. These are trouble-free plants once established,and tolerate drought and poor soils. Trim back plants after flowering to maintain a compact shape, or to contain plants that spread too far. Mature plants can be divided in spring and stem tip cuttings can be taken in spring to early summer.